Location: Boothby Graffoe, Lincolnshire, England. 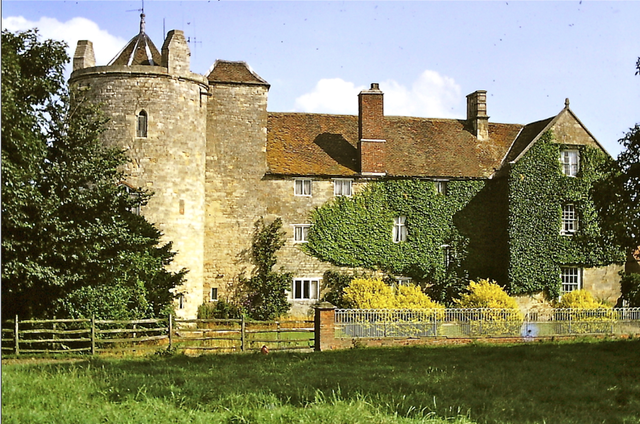 Notes: Somerton Castle is located approximately one mile west of the hamlet of Boothby Graffoe in Lincolnshire, England. Inherited from his mother, the castle was rebuilt in the latter part of the 13th century by Antony Bek, then Bishop of Durham, who was granted a licence to crenellate in 1281. In 1309 Bek gave the castle as a gift to King Edward II, and it remained royal property until the reign of Henry VII. During the 15th century lack of maintenance by tenants caused the castle to fall into disrepair. The property and estate were bought from Sir Montague Cholmondeley, Baronet in 1812 by the notable Lincolnshire and Sussex landowning family Marfleet Battle; the property and estate later passed on to several of the family's descendants. King John II of France was imprisoned at Somerton Castle between 1359 and 1360, having been taken prisoner after the Battle of Poitiers. Sir Saier De Rochford, ancestor of the Rochford family of Stoke Rochford, "an eminent soldier in the wars of France," High Sheriff of Lincolnshire, and a commissioner of Lincolnshire banks and sewers, was allowed two shillings a day for the safekeeping of King John while at Somerton. Some prominent and visible enclosures still enclose the site, including parts of the moat. What remains of the castle walls are incorporated into the present farmhouse. The castle has been recognised as an important building and has been classified as a Grade I listed building.